On August 23rd in 1963, Randall Moller was born in Red Deer, Alberta. 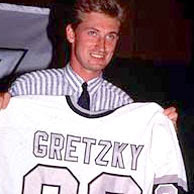 Raised by Lethbridge's Broncos, Randy's teenage scoring touch and fisticuffs earned him the 11th overall pick in the 1981 NHL Entry Draft. Relegated to an enforcement role from the outset, Moller collected 1692 penalty minutes and 45 goals in 14 NHL seasons. Today Moller makes his living calling the action as a play-by-play announcer for the Florida Panthers on Sports Talk 790. His claim to fame is incorporating fan requested pop culture references into his goal calls. What he lacks in originality he more than makes up for in enthusiasm. On August 20th in 2010, Vancouver Canucks superfan Michael Bublé and play-by-play personality John Shorthouse joined the ranks of Bing Crosby, Ella Fitzgerald, and Frank Sinatra tweaking Bob Hope's rendition of the 1938 Academy Award winning classic "Thanks for the Memory", this time in a touching tribute to the club's retiring colorman Tom Larscheid during a hometown sold-out stop on Bublé's Crazy Love tour. The seeds of the performance were sewn when Bublé shared the broadcast booth with Shorthouse coloring a 7-3 drubbing of the Chicago Blackhawks and the Kerrisdale kid accepted the Burnaby crooner's invitation to one day join him onstage. Eighteen months later Shorty made good on his postgame promise producing this dazzling duet. Clearly more comfortable calling puck than singing standards, Shorthouse sweated through the serenade like a pro. The memorable performance was followed by a succinct video salutation to the 33 year veteran voice, climaxing with an appearance by the living legend himself. In the end, it was Bublé who found the perfect words to memorialize the man: "you're a beauty Tom, you're a beauty." A fitting farewell to a beloved member of the Canucks family. How lovely it was, indeed.